Took a snapshot from night run on Friday. Being three weeks out from Collegiate Peaks, I wanted to get in one last long run over the weekend. The problem was that I didn't have the time. 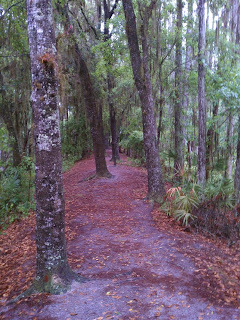 We were busy both Saturday & Sunday, so I opted for a night run on our local trails. I wasn't thrilled about it, but decided to make it fun with some simple goals. 1. Make it a timed run and keep the clock running until it hit five hours. Don't worry at all about pace or distance. 2. Fuel exclusively with solid food. I popped the grape flavored 5 hour energy down the hatch about a minute before leaving the house at 8:15 p.m. I can't say I felt anything, but I did remain fairly alert for most of the run. Here's what I brought for fuel: boiled and salted potatoes, white chocolate & macadamia nut cookies, oatmeal frosted cookies, and some animal crackers. I waited about an hour until I began eating since I had just polished off dinner two hours before I started. The plan was potatoes on the hour and cookies on the half hour. While I'm glad I did it, I probably won't be employing this strategy in a race. Fuel-wise it all kept me going just fine. At about hours 3.5-4, I felt like all that food was inching its way back up my throat and settling just at the base. My experiment had to stop. I brought two "emergency" gels in my pack and took those during the final hour and a half. Overall, I had a good run of 30 miles finishing at 1:05 a.m. I went at an easy pace, spooked a bunch of deer and elk, listened to 22 chapters of a book on one of those "playaway" devices, and finished with some mellow tunes. My favorite aspect of this run was the moonlight. It was two nights before a full moon, so there was enough moonlight to afford keeping the flashlight off for 75% of the run. It is not often I get to run trails in the dark without a light. It takes the peacefulness of the experience to a whole new level. 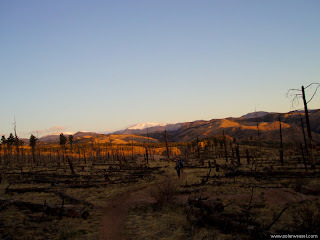 Ever since the Moab Red Hot 55k, I've been thinking about what I can do to improve in races. Don't think that I'm sitting here grumbling about my performance in any of them. In my first four ultras, I've finished in the top 30 in each. I have an enormous amount of contentment with these races and consider it an achievement just to start/finish them. I have always tried my best and will continue to do so in any race I run. But I know I have room to improve. The issue I struggle with is what it will cost me to improve. I'm having too much fun with running right now to make it a chore. I can fit running into my family life, and won't make sacrifices that will negatively impact my ladies! So, where does that leave me? I've come up with a few tangible things that will help me (I hope!) 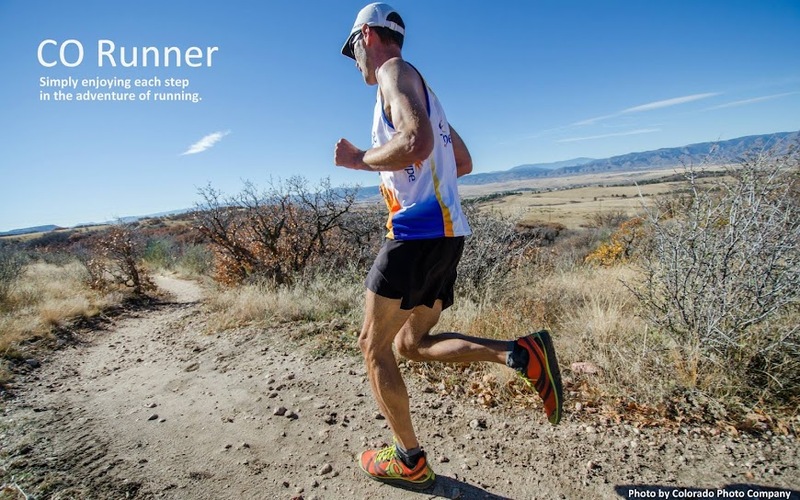 improve as an ultrarunner. 1. Double Sessions - I've always been intrigued by having an AM & PM running session. That's about how far I've gone with it. Time and energy have never cooperated to make it happen. But recently, I picked up on a tip from Footfeathers, who said he builds planned "fast walking" sessions into his training. This is something I've neglected in my training, except when the terrain on a long run demands it. To that end, I've started hitting the treadmill 2 nights a week to practice my walking. I crank it up to 10% and set the speed at 4.7 mph. At first it seems easy, but by the first mile, I'm drenched in sweat and woozy in the head. The farthest I've gone is 2.5 miles and by the end of that workout, my feet were barely staying on the mill. The best part is that I have my girls join me in the basement for this workout. They play while I walk. I crank up the kid tunes on Pandora and watch the show they put on for me. M & Z run around doing flips on beanbags, flips on the couch, dancing to the music....all while I huff and puff away for 30 minutes. 2. 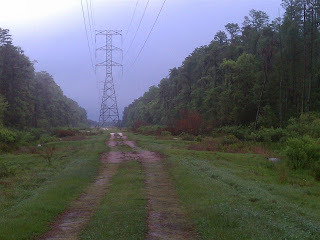 Midweek run with elevation - Last week I started heading to the foothills for a 10-12 mile run during the week. I plan to keep this going into the summer with the goal being to get some additional elevation that I just can't get on my local trails. Scott & I met at Mt. Falcon last week and ran 12 miles before 7:30am. Nice! 3. Strength trainings...sort of - I have always had an aversion to lifting weights. I've never enjoyed any form of strength training, so I simply avoid it whenever I can. Bandera made it clear that I need to do something in this area. I had moved some furniture a few weeks before the race and was left with a sore back (had difficulty putting my socks on). During the race, my back and shoulders were really aching. I'm committing to 60-65 push ups and sit ups twice a week. I'm sure I can hear a few chuckles out there as this commitment is nothing earth shattering and most people could bang that out in one shot. Not me! It is a heck of a lot more than I've done in a long time! Hopefully that number will slowly grow as I build strength, but it's taking all the willpower I have to do them. Oh yeah...and no furniture lifting/moving close to raceday! 4. Fix Your Feet - I'm reading it right now. I want to be ready for the next time I encounter foot troubles during a race. Hopefully, some new knowledge will help prevent the blisters and other junk from even starting. 5. Diet - Haha! Yeah right. I've thought about making changes to my diet (ie. cutting out the junk), but I'm not quite there yet. Maybe that'll be a sacrifice I'll consider next year! I know there are many other things I could (or should) be doing to improve, but this is a start. 3/19: Deer Creek (15 mi) - Got out with Scott, Patrick, Joe, and Ryan. Started just before sunrise and had some perfect running weather. 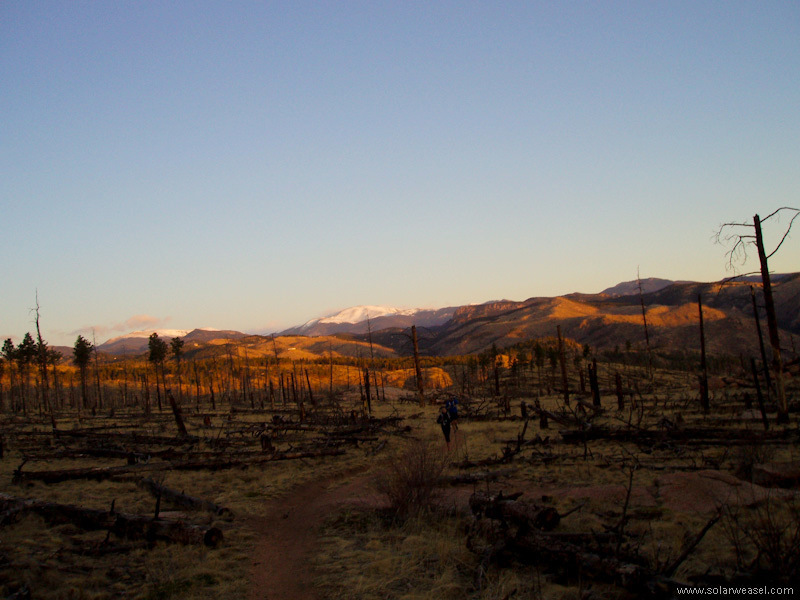 3/26: Pine Valley Ranch (32 mi) - Patrick led a group of us (Ryan, Leila, Brendan, and I) around the trails that make up the North Fork 50 course. I thoroughly enjoyed this run on some "new to me" trails. I was curious what it would be like running through a burn area, but everything about it was beautiful. I will be back. 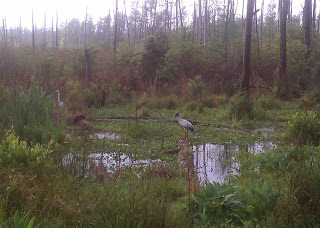 3/29: Shingle Creek Management Area, Orlando, FL (12 mi) - I was at a conference for the first part of last week. 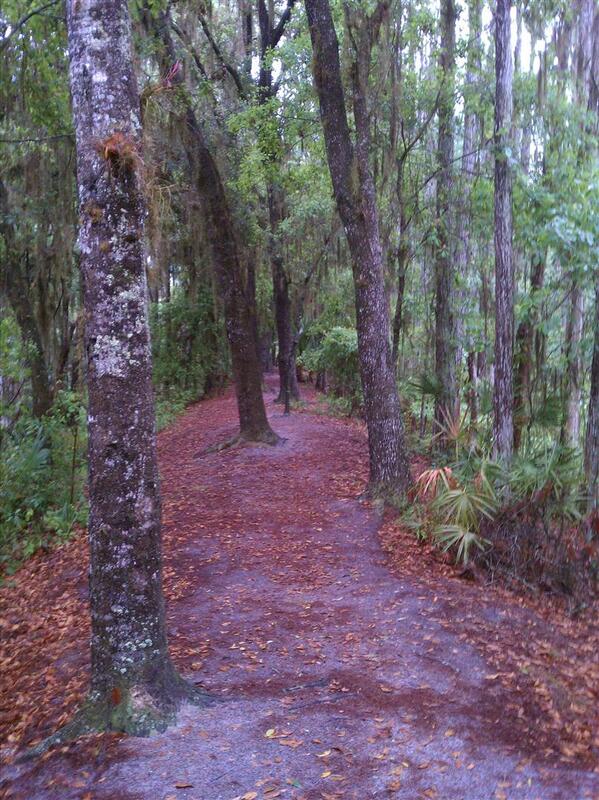 I was fighting a nasty head cold, but got in one outdoor run and found my way to Shingle Creek. 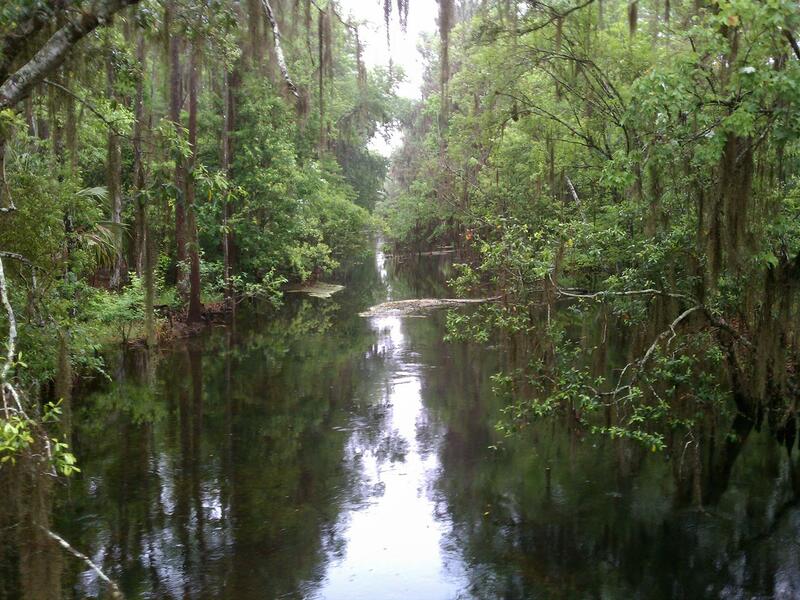 It is a small oasis in the SW part of Orlando. Once you enter the park, you forget about the cars, neighborhoods and other signs of the city. 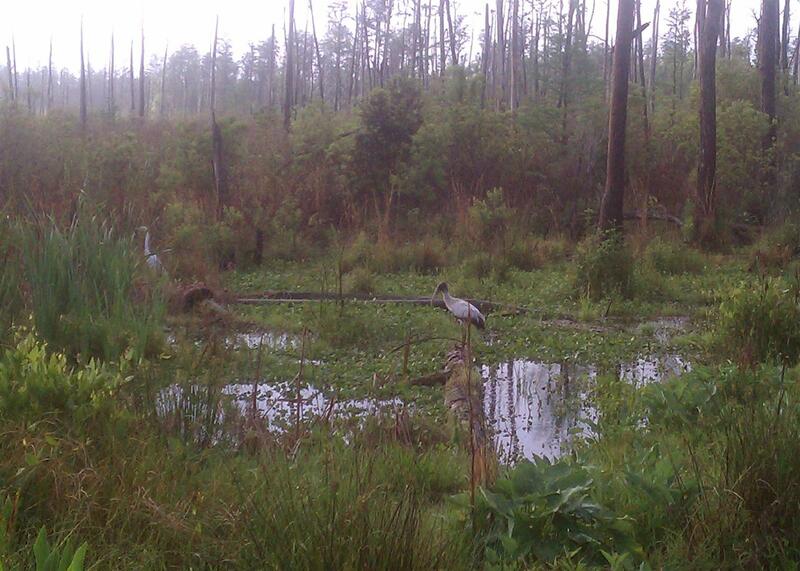 It is almost all wetlands, so there are plenty of birds and other creepy crawlies to be on the lookout for. I thought for sure that EVERY root from these trees was a snake. There was about three miles of a powerlines trail. Not boring at all because of the water on either side...and noises. This is what it looked like everywhere. 4/2: Mt. Falcon (17.5 mi) - I met up with Joe and Jim for a v1 tour of the hill. We started in the dark, but were treated to an amazing sunrise about 40 minutes in. When we finished, I went out for a quick Turkey Trot-Castle trail loop before heading home...not sure why I did since one lap around Falcon leaves me plenty beat up. As Collegiate Peaks gets closer, I'm feeling good about the base I've slowly been building. I think the training and races I've completed over the last 5 months have been digested and the effects are working in my favor. I've heard that transitioning to ultras can take time for your body to adjust to longer distances. I'm not sure if that is true, but something is starting to click better for me. Getting my weekly mileage into the 70's feels really good right now. I remember feeling like that was a struggle last year. I'm looking forward to a solid effort at CP, but have no plans to go all out. I want to continue to build slowly and peak for San Juan Solstice in June. I'm not sure I know how to time my training in order to peak, but it sounds good to talk like I do.